If you had seen Frederick Novy at the University of Michigan between 1888 and 1933, you might have dismissed him as an eccentric scientist in a threadbare suit and mismatched coat, careening across campus on his bicycle, oblivious to much except the thoughts in his head. You could have even shrugged at the way he holed up in his dim and cramped lab until late at night, poring over data and experiments, almost to obsession. Through the emerging field of bacteriology, Novy would change the fundamental way medicine was taught, demanding students test and prove. He became the leader of a new breed of physician: academic researchers who did not practice medicine. He would engineer new lab equipment to better see organisms on a cellular level, at a time when some of his U-M colleagues didn’t even believe in germ theory. And although he would tout the importance of scientific experiment for its own sake, without worrying about pragmatic application, his work would have profound effects on a deeper understanding of how germs and bacteria behave, leading to reduced incidents of dysentery, cholera, tuberculosis and more. Novy was born in Chicago in 1864 to parents who had emigrated from Bohemia (now part of the Czech Republic). He was interested in science from an early age, setting up his own chemistry lab under the back steps of the multi-unit dwelling where his family lived. After blowing the steps up by accident, his father moved his experiments to the backyard woodshed. Novy entered U-M in 1882, studying chemistry as an undergraduate. He graduated in 1886, received an M.S. in 1887, an Sc.D. of physiological chemistry in 1890 and an M.D. in 1891. A forward-thinking physician named Victor Vaughan, M.S., Sc.D., M.D. (who later became dean of the Medical School) spied Novy’s potential and appointed him assistant in the new hygienic laboratory, which Vaughan founded in 1887. The lab performed bacteriological analyses on water, milk and other substances while also carrying out independent research. Together, Vaughan and Novy worked to advance the study of bacteriology at U-M. In the summer of 1888, the pair traveled abroad, training in the laboratories of Robert Koch in Berlin. When they returned to Michigan, Novy delved into the study of microbes and germs not to cure disease, but for fundamental, “pure” scientific understanding. It was a dramatic shift. Previously, public health departments had viewed disease as something to be stopped — by administering vaccines, reducing rat populations, testing drinking water and other hands-on measures. Now, Novy and Vaughan had equipped a university with a lab for research, working tirelessly to understand germs fundamentally and how they lived in nature. Not everyone agreed with this approach. Heneage Gibbes, M.B., a professor of pathology who did not believe in germ theory, was fundamentally opposed to Novy’s course dedicated to bacteriology, which Novy launched in the fall of 1889. Along with H.L. Obetz, M.D., dean of the Homeopathic School, Gibbes petitioned the U-M Board of Regents to eliminate Novy’s teaching position. With the backing of Vaughan and the ability to reproduce lab results with rigorous methodology, Novy triumphed, and Gibbes left U-M within a year. By 1890, Novy’s bacteriology course was required for all students. Novy’s growing reputation and expertise led federal officials to ask him to serve on an independent commission to gauge whether the plague was present in San Francisco in 1901. Novy agreed, thinking this could be an opportunity to take his laboratory investigations to the site of an outbreak. He departed for San Francisco on Jan. 24 , 1901. The situation in the city, however, was fraught with politics. Harry Gage, the governor of California, denied the claims, likely to alleviate panic and keep trade flowing. Added to this were racial and cultural stereotypes linking the plague to the city’s Chinese residents, who were thought to carry the disease due to hereditary factors. “The press and the people are unanimously against the idea that plague exists here,” Novy wrote to his wife, Grace, in letters archived at the Bentley. In spite of Novy’s ability to isolate Bacillus pestis — demonstrating proof that plague was indeed in San Francisco — it wasn’t spreading as rapidly or causing social disruption, and Novy was unable to explain why. Nevertheless, in late February, he and the other commissioners finalized their fact-finding report. Initially, Gov. Gage suppressed the report, but the surgeon general published the findings a couple of months later. Reluctantly, the governor authorized funds for anti-plague measures, including sanitation and disinfection. It wasn’t until 1903, however, when incidents of the plague were on the uptick and the city was threatened with a trade embargo, that robust rat control and sanitation measures were put in place by a new governor who also was a former physician. Back at U-M, Novy continued to introduce medical students to the latest scientific techniques. He helped students become familiar with preparing and staining specimens, plating and incubating bacteria, inoculating lab animals and more. He stressed technical proficiency and the scientific method. Many students responded to the rigor and methodology. “If greatness be measured in terms of medical teaching, Novy was the greatest we ever had,” former student David Sugar, M.D., wrote about Novy in the Detroit Medical News. Those students were right to be grateful to Novy, not just for the precision he instilled in them but also because he was changing an entire scientific field while he taught them, says Powel Kazanjian, M.D., Ph.D., professor of internal medicine and chief of the Division of Infectious Diseases, and professor of history in the College of Literature, Science and the Arts. Kazanjian wrote Frederick Novy and the Development of Bacteriology in Medicine, which explores Novy’s impact on medicine and society in America. Novy retired from the lab in 1933 but stayed active in the field. He published his last scientific article in 1953 when he was nearly 90 years old. 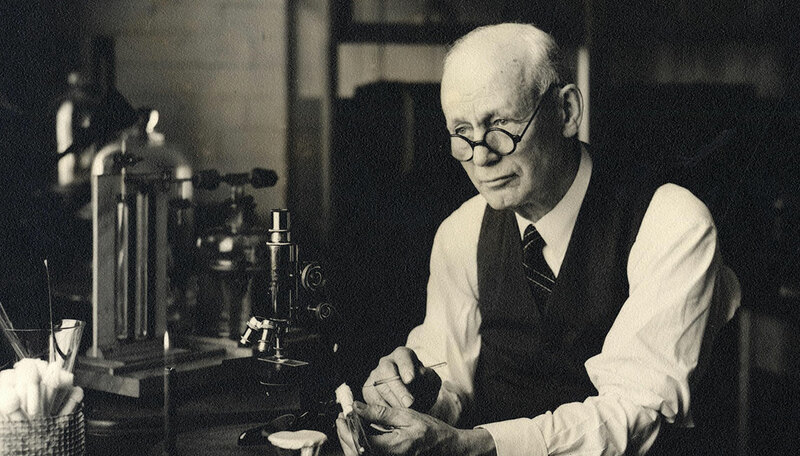 He died in 1957, but his impact on research, and the Medical School, is still felt today. An overhead image of a canoe livery and a previously unknown Kandinsky painting? Not quite. These are slides that were used in Frederick Novy’s bacteriology course, showing a parasite in the genus Trypanosoma (left) and the bacteria Spirillum equi (right). Novy was tireless in his work to observe organisms, taking pictures through his microscope and transferring them onto slides. He’d then jot notes in the margins of slides. The Frederick G. Novy Papers, Bentley Historical Library. The collection also contains his notebooks, letters, lab notes, photos and more. Frederick Novy and the Development of Bacteriology in Medicine, by Powel Kazanjian, M.D., Ph.D. (Rutgers Press, 2017). “Frederick George Novy, Microbiologist 1864–1957,” by S.E. Gould. American Journal of Clinical Pathology, vol. 29, no. 4, April 1958. Photos by Leisa Thompson Photography. Slides and archival images from the Bentley Historical Library.